WHEN I WAS A KID I USED TO PAINT MT FACE JUST LIKE A CERTAIN MEMBER OF KISS… BUT DON’T TELL ACE, FOR WHOM 2014 IS LOOKING LIKE A VERY GOOD YEAR. Now where do you begin this story? Is it a million years ago when you were a kid, with Kiss and all that they meant to you growing up? Or just at the point where you dial that number and wonder if the silence at the end of the phone is that which Ace himself inhabits? I guess I’ll come clean then… Kiss to me, as a kid, was everything. It’s hard to describe now how much they meant, but somehow in a world without internet or mobile phones, and by that I mean in a world where you had to seek things out rather than push a button and they found you, they were both a band and an enigma. The enigma came largely from the fact that growing up in the UK all you could do was gaze into the gatefold covers of Alive and Alive II and dream. You could read about them of course in magazines like ‘Sounds’ that left ink on your fingers, but largely they were intangible: ensconced in their castles and spaceships venturing out to thousands of American kids to put on shows full of pyrotechnics, fire-eating and (above all) Rocket-firing guitars! In the seventies you see we lived in a world where miracles happened slowly. I saw my first colour TV then, and one day we got a phone in the house! In those days, as a kid, the music that you heard came from magazines, from friend’s brothers and sister’s record collections and if you were lucky the radio late, late at night would play a song with a guitar solo in it. I think I possibly loved Kiss even before I heard their music, but then it came fast. A friend taped me a record called ‘Double Platinum’ – wow what a title – a title I was sure came from the fact it was a silver cover and a double album! As soon as I heard it I was blown away, literally blown away like I imagine my parents had been hearing Elvis or the Beatles for the first time, and while the cool kids listened to Zeppelin (who were still around then) and Pink Floyd, me and my best mate Steve we decided that Kiss were the band for us. Even before you heard the music of that solo album there was excitement – it came with one part of a four-part cartoon poster of Kiss – my part of course featured Ace in all his silver-suited glory. The first time I saw Ace on stage was on the Alive Worldwide Tour (the Reunion Tour) in 1997 when it hit Sydney Australia on February 5th. I saw him again the very next day at the same venue. By the Farewell Tour in 2001 I had moved west to Perth for the first time and caught Ace on the 29th March at the Burswood Dome – a venue I still contend had the worst sound of any large venue in the world. Cue seven years later when I visited the Rocklahoma Festival for the first time in Oklahoma USA and sang all the words to all of the songs as Ace and his band took the stage, stopping only to run down the camera alley to take a few shots. Mark: Hi, Ace, it’s Mark from The Rockpit, in Australia. Thanks for speaking to us this morning; I must admit it’s one of my dream interviews! The new album has been played to death down here at the office this last week. It’s looking like a great year for you, Rock and Roll Hall of Fame, and new album, and hopefully the new book’s coming along ok? Ace: Yeah!! The album isn’t released yet, is it?? Mark: No, I’ve just been listening to the advance copy, Ithink it’s released on the 18th August down here and in Europe. Ace: It’s not being released until August 19th here in the States. Mark: Let’s talk about the album then – I mean as a fan it sounds absolutely wonderful, and to me it’s sound owes a lot to that first solo album of yours in 1978, was that a conscious effort on your part to reference that album? Ace: It was something I was going to try to do, and everybody cites my ’78 solo album as their favourite Ace record. I listened to it several times, and tried to write songs that were similar. I got together at the end with Warren Neward who’s a great mixer, an English chap; he really helped tie the album up with a nice red bow. The last three weeks I was mixing with him, I wrote “Space Invader” and “Past the Milky Way”. Mark: “Past the Milky Way” has to be one of my favourite tracks on there, that was just a song that came to you, was it? Ace: That was actually an instrumental up until about two weeks before the album was due! I wrote that for my fiancée, Rachel Gordon. 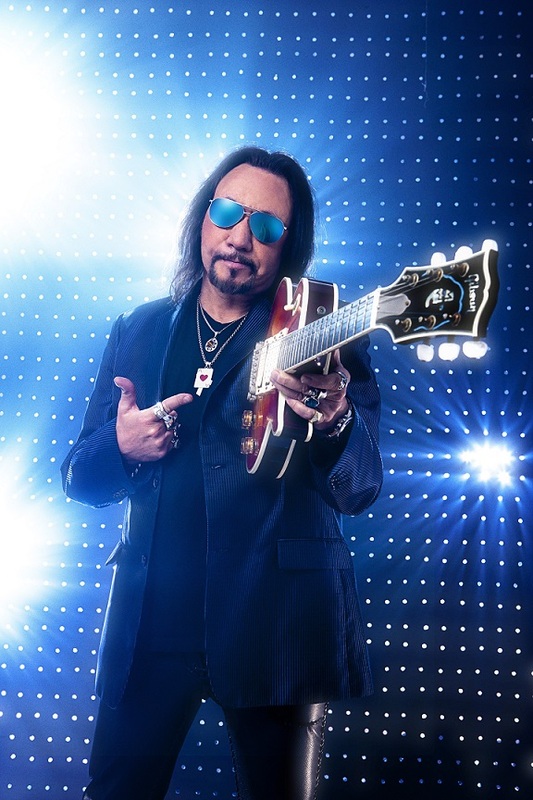 Mark: It’s a fantastic song; I think that and probably the real Ace Frehley classic, “What Every Girl Wants” are my two favourites on the album at the moment, but it’s one of those albums where that can change every day. It’s the album I’ve been waiting a long time for! Ace: Thank you so much. Mark: The single, “Give Me a Feeling” is a great way to start, is that a song that’s been with you for a while, or was that a new song also? Ace: I actually co-wrote that with my assistant, John Estrovski, he actually had an instrumental track that he gave me, and I rearranged it, changed it, and added some riffs, came up with that, and wrote the lyrics and melody. That was one of the first songs we tracked, we tracked that last summer. Ace: I had known Ken over the years and had bumped in to him a couple of times at “Monster” conventions, because I do signings there once in a while. It didn’t happen for “Anomaly” because I designed that cover, and this one, we came up with the title, “Space Invader”, and they submitted some art work, and we talked about a space ship and me coming out of it. I was talking to one of the guys at e-One – Ken Gulick; and I said why don’t we get Ken Kelly, to paint it? And it just like all happened right away, it was just like one of those spontaneous things. Mark: Do you have any particular favourite tracks on the album? Ace: I’m still getting used to it! Because like I said, “Space Invader” and “Past the Milky Way” are still new to me, I just wrote them. I don’t have any favourites as of yet, I like “Space Invader” because I just think its classic Ace! Mark: It is! Aside from the originals there’s also a cover on there of the Steve Miller song, “The Joker”, does that song have a particular meaning for you? I know you covered The Sweet’s ‘Fox on the Run’ on your last album. Is a cover song getting to be a calling card?. Ace: It has no particular meaning for me, it actually wasn’t even my idea, it was recommended that I track that, I was a little resistant to it, but then I remembered back to 1978 when I did my solo album, Eddie Kramer’s assistant wanted me to do “New York Groove”, and I initially didn’t want to do that one, but it turned out to be my biggest hit, so I figured this time around I’d get out of my own way, and I’d just take the suggestions!! Mark: It actually sounds like it was written for you, it works that well, it’s a great song and you add a bit of ‘Ace’ to it! Mark: Obviously a lot’s happened this year and I loved reading “No Regrets” when it came out, do you think Paul Stanley’s comments on yours and Peter’s books was a publicity stunt? Do you think he was trying to stir things up a little? Ace: Oh, I don’t know! Paul’s been acting pretty crappy lately, complaining about anything and everything, so I don’t know! Mark: How’s your new book coming along? Are we likely to see it soon? Ace: I have a couple of chapters written, it’ll be along the same lines as the first one. I don’t believe in bashing people, I don’t believe in a lot of negativity, so most of the stories in the book are going to be about me, funny stories and funny situations on the road, all stories about me in the Bronx growing up, and so on and so forth. 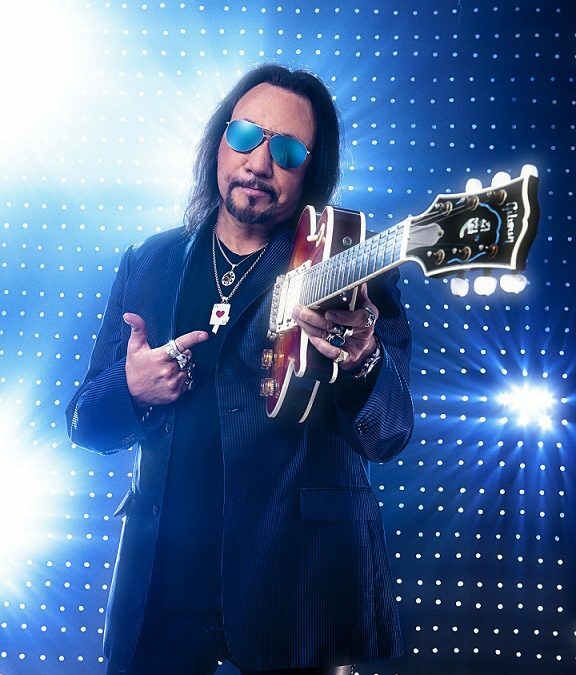 There wasn’t much in the first book about the “Frehley’s Comet” years, and there’s plenty of stories along those lines, there’s still plenty of Kiss stories, and plenty of stories of me growing up. I probably have enough stories for five books! Mark: Do you put aside time to write or does something just come to mind and you jot it down as you go? Ace: Every day I wake up and I remember something else that I completely forgot about! You know, I just turned 63; I’ve lived a lot in my life. The latest thing was I was just talking to my fiancée, Rachel, about the time I went over to John McEnroe’s house, the famous tennis player, and I remembered something! I’ll have to give John a call and document it for my next book! Mark: That would be something worth reading in the next one definitely! I remember he was quite a good guitarist who looked up to your playing! Ace: Yeah, that’s a story I gotta document, it’s going to be as good, if not better than the first book. Mark: As someone who is cited as being a major influence of many guitarists, who would you say were your main influences? Ace: As a teenager I grew up with Hendrix and Clapton, Jimmy Page, Jeff Beck and Pete Townsend, and those five guys were probably the biggest influences on me in my formative years. Mark: And which riffs do you think you have heard repeated by most guitarists, outside of Kiss? Ace: Some of my trademark riffs are derivative of other guys and it’s only rock and roll after all, there’s nothing 100% original in rock and roll, and everybody kind of steals a little from everybody. It’s very flattering that so many guitarists cite me as a major influence, it’s a big honour. Mark: I think it’s the fact that you’ve got that distinctive sound and that appeals to a lot of people. You’re one of the few guitarists that have that individualism – you can hear a piece of music and instantly say, “That’s Ace!”, and there are not a lot of guitarists out there especially these days where you can actually say that. I notice that there’s no tour dates scheduled for you this year as yet, are you looking at taking the album out on the road soon? Ace: Yeah, we’re planning on doing some shows in the U.S. in the fall, and hopefully we’ll get down to Australia at the end of the year, or early next year, and Europe is asking us to come back. I haven’t been to Japan in a long time, and usually when I do Japan, I do Australia too because they’re close to each other, so maybe I can tie that together. Mark: That would be great, the last tour was fantastic down here and you packed the venues to bursting! Mark: If you could have been a fly on the wall for the creation of any album, at any point in time, what would it have been for you, and why? Ace: The Beatles, “Sgt Pepper”. That’s the first one that comes to mind or maybe “Fresh Cream”, and “Disraeli Gears”. Cream were a major influence on me, it was amazing how much music they made with just three guys. Mark: Finally the easy question, what is the meaning of life? Ace: Oh, I don’t know. I think the most important thing though, is to be true to yourself, and follow your dreams, and if you do that, there’s a good chance you’ll have a good life. Mark: I think so! Well, thank you so much for talking to The Rockpit today; it was a pleasure for me. I have a small confession to finish if that’s OK? I used to, when I was young, one of my party tricks was I recorded all of your guitar solos, from “Kiss” to “Unmasked” and I used to be able to name each song after two or three notes!! I had to confess that to someone, and it might as well have been to you!! So, you have made my year, thank you so much! Good luck with the new album. Ace: That’s great. Someone just told me the other day that they took all my instrumentals and put them all together on one CD, I guess the guy has to add “Starship” now! Mark: I love that song, and the way it’s bass-driven as well. It’s a little bit different for you as far as instrumentals go. Ace: Chris Wyse is playing bass on that, the bass player with The Cult. Mark: Oh really? I caught up with him when he was down here last year, lovely guy and a great bassist. Hopefully we’ll see you back in Australia soon. Ace: Yeah, I’m going to try and get Chris in my touring band. Mark: Now that would be great. Thanks again, Ace, take care. Ace: Thanks a lot Mark, you have a great day!